Chop all the veggies. 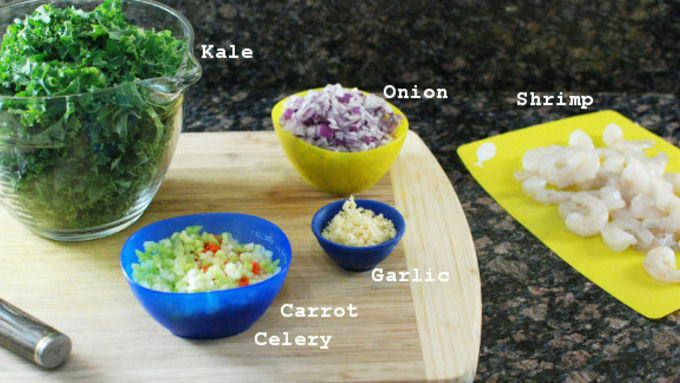 Remove the kale from the stems and chop very small. Clean and prep the shrimp. Rinse the quinoa really well. In a medium sauce pot or dutch oven, cook the carrot, celery, and onion in a little oil for 10 minutes. 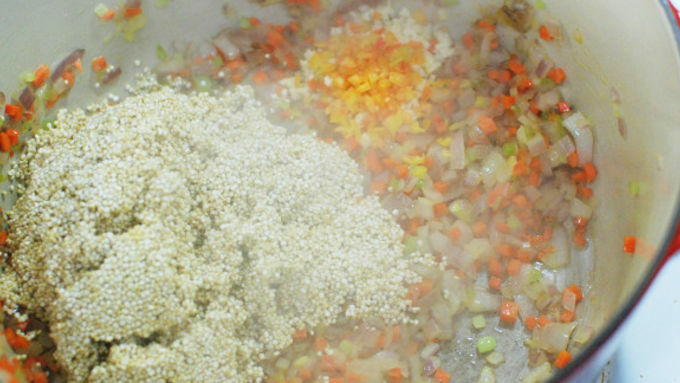 Add the garlic and the quinoa and cook for about 10 minutes stirring often. You want to lightly toast the quinoa but not burn the garlic or other veggies. Add in the kale and stir well. Add about 1/3 of the veggie stock and stir well. Cook on a medium-low, stirring often until most of the stock has evaporated. Repeat with the next third of the stock, and then the final third. this should take about 25 minutes. 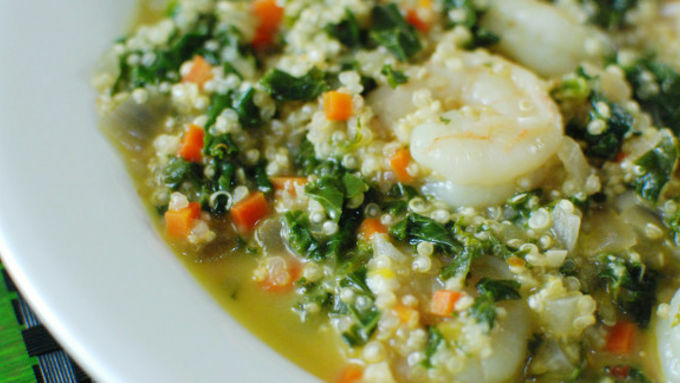 Finally, when the quinoa is tender and there is still a fair amount of liquid in the pot, add in the shrimp and stir. Cook about 3 minutes at a light simmer until the shrimp turns white and is fully cooked. Remove from heat and stir in the yogurt. Serve. Time to lighten up with good-for-you food, and this is it! Welp, here we are. 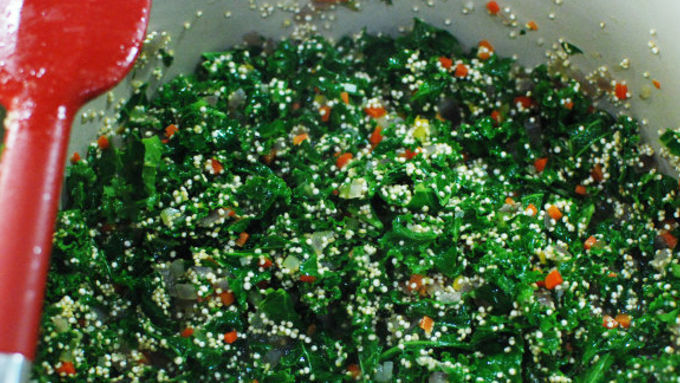 Time to trade in your cookies and ham for quinoa and kale. Nobody wants to do it, but it's just that time of year. But if you do it right, it doesn't have to be bad. In fact, with dishes like this one, it can be pretty good! You can “risotto” any grain, and quinoa is one of the healthiest ones out there so I decided to try it out. It doesn't get as creamy as rice or barley, but with the help of a dollop of yogurt, you get a really nice texture and deep flavor. 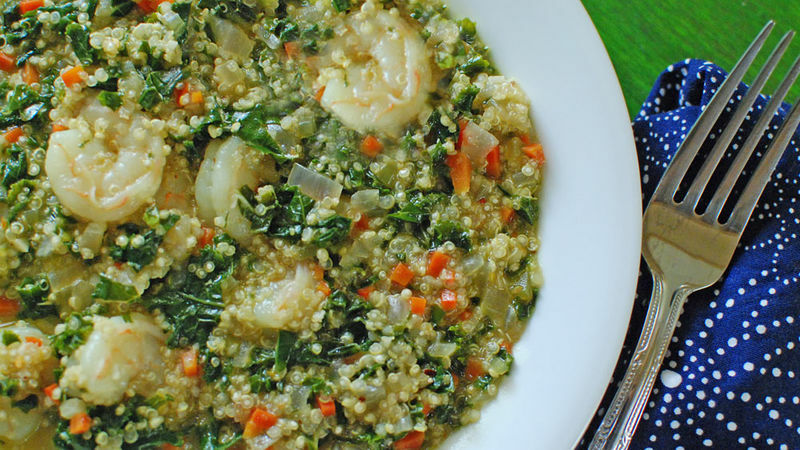 Pop in a few shrimp and you have a healthy meal that's hearty and filling on a cold winter evening. Super healthy, creamy, and delicious!